Sign up to Grosvenor Sports and deposit £10 to receive the maximum benefit from the 100% boost. If you want to, you can deposit £20 triggering a £20 casino bonus too - the instructions on this can be found at the bottom of this page. If you decide to deposit £20, follow the Sports instructions first. If you decide to deposit £10, you won't receive a casino bonus and so ignore that part. a) Choose a popular league or cup on Grosvenor. b) Choose a team above the 1.5 minimum odds and below the 21.0 maximum on Grosvenor. I would recommend odds of around 3.0 to make £5 profit (requires around £25 of liability). If you have more funds in your exchange then you can choose higher odds and make a few pounds more profit! Ideally the chosen team should have the lay bet odds within 10% of the bookmaker odds. For example, if your bookmaker odds are 7.0, aim for Betfair Exchange lay odds no higher than 7.7. But I would try and get below 7.5 for this offer. This is where this offer becomes slightly different to others you'll have experienced. 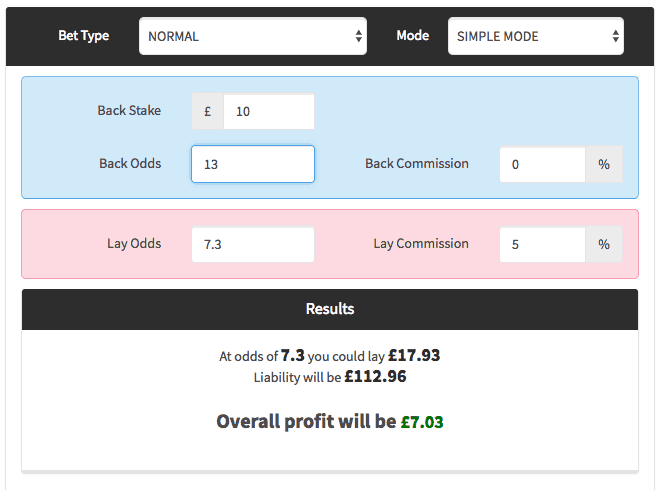 To lock in profit from the 100% boost, you need to enter double back odds in the Calculator. Double Back Odds = Original back odds multiplied by two then minus one. E.g back odds of 3.0, multiply by 2, equals 6, subtract 1, gives you new back odds of 5. Back stake will be £10 and lay odds remain the same as they are showing in the exchange. Select 'normal' on the calculator and hit calculate to see your profit. In the above example we see that finding a back bet with 7.0 odds (boosted to 13.0) and lay odds of 7.3 results in £7.03 profit! If you deposited £20: You will have £10 left in your balance. You need to also place this on a sports bet at close odds in order to use your casino bonus. If you don't, then the casino will use your cash first instead of the bonus and so you could lose the £10. So go ahead and place a back and lay bet for the remaining £10 in your account. Now you can use the £20 Casino bonus. You must use this before the bets have settled, because if either bet wins then your balance may combine with the casino bonus. Simply open up Blackjack or any Slot and wager the bonus 5x (£100). They have specifically said that even money bets do not count towards wagering so don't go on roulette and bet on red/black, stick to either slots of Blackjack. Stop when you either lose the £20 bonus, or when you wager £100. After you have wagered £100 all winnings will go into cash balance that can be withdrawn along with your sports bet winnings. Congratulations, that's it done - Risk Free Profit! Easy money! If your trigger bet won in Grosvenor, then withdraw these winnings.